Frontier Airlines, which added many new routes earlier this fall, has brought back its 99% off sale. But you will have to move quickly, because the offer ends at midnight on November 13. The cheapest tickets come over short distances, but there are deals all over. The best prices will get you flying round-trip for less than $50. The cost you're paying is largely categorized as taxes and "carrier imposed fees." You aren't getting 99% off of those. All you have to do is drop in the code "SAVE99" at checkout. However, even if you miss the midnight deadline, it's worth digging into prices, because the airline has been offering good deals lately. To get your piece of the pie, take a look at the obligatory list of excluded routes. There aren't many, but a handful of routes get 0% off flights today. Additionally, the deal is only valid on the following days: November 29, December 2, 5-6, 2-3, January 9-10, 20, 22-24, 27, and 30-31. The 99% off ticket prices is as eye-catching as a fight scene set to "Immigrant Song," but get a full picture of what your flight will cost before clicking "purchase." 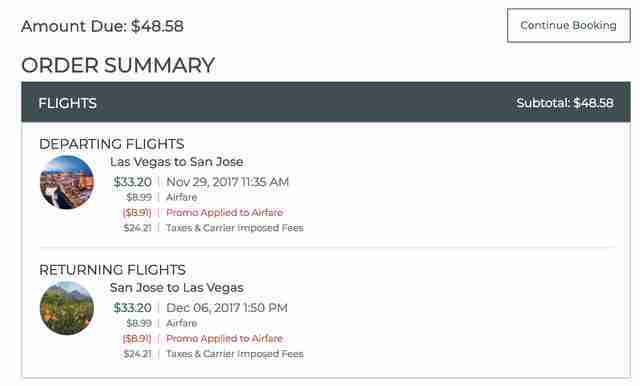 Frontier is a budget airline (with a less than stellar on-time arrival rate) and charges for most the selection of most seats, as well as carry-on bags and checked bags. The airline's deals are best suited to travelers who can travel light, are willing to be assigned a seat, and know how to pack like a master. November and December aren't hot times for impulse traveling, but maybe you're one of those people who hasn't used up their vacation time. Don't do that. Go to... uh... Nashville? It's a cool city and anywhere is better than losing vacation days.